Star Ocean 5 and World of Final Fantasy stages planned. 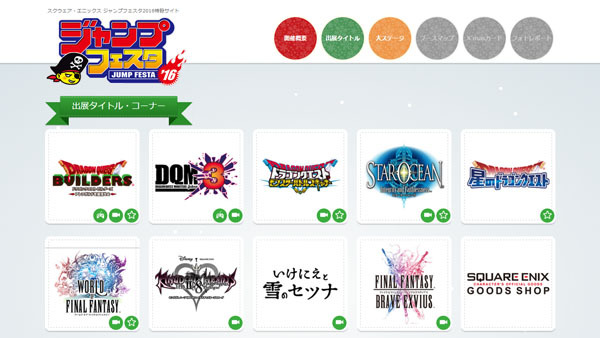 Square Enix has announced its lineup, stage schedule, and opened the official website for its Jump Festa 2016 showcase. 10:30 to 11:30 – Star Ocean: Integrity & Faithlessness Special Stage – A talk show featuring voice actors Kaito Ishikawa (Fidel), Yuichi Nakamura (Victor), and Junichi Suwabe (Emerson). 12:30 to 13:30 – Dragon Quest Builders Builders High School Extracurricular Lesson – Featuring producer Noriyoshi Fujimoto, assistant producer Takuma Shiraishi, V-Jump’s Side-V, and MC Ranze Fukushima. 14:30 to 15:40 – Dragon Quest of the Stars Super Giga Rare Stage – Featuring producer Ryutaro Ichimura, administrative producer Yuta Nagano, V-Jump’s Side-V, and MC Ranze Fukushima. 13:00 to 13:45 – Dragon Quest Monsters: Battle Scanner Special Stage – An introduction to the 2016-due arcade game Dragon Quest Monsters: Battle Scanner featuring producer Ryutaro Ichimura, voice actors Mutsumi Tamura (Dragon Scanner) and Yoshiki Takajima (Battle Commentary), and V-Jump’s Side-V.
14:45 to 15:45 – World of Final Fantasy Special Stage – Featuring MC Hideo Ishikawa, voice actors Sora Amamiya and Ayana Taketatsu, and director Hiroki Chiba. Jump Festa 2016 runs from December 19 to 20.